The Verizon Amphitheater in Alpharetta, Georgia, recently hosted Live Nation’s “I Love The 90s” concert, to the delight of more than 11,000 fans. AEE Productions, based out of Atlanta, Georgia, provided a EAW KF line array system to reinforce the sold out show. The Verizon Amphitheater sports a distinctive fan-shaped roof, comprised of a translucent cloth-like material, suspended over a steel-framed structure. 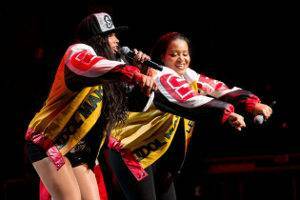 Salt n Pepa rocked the house during the recent ‘I Love The 90s’ concert reinforced by EAW KF Series line arrays. Located on 45 acres of land, the venue seats 7,000 under the roof and another 5,000 on the lawn. The “I Love The 90s” concert featured a number of well-known groups from the 90s including Salt N Pepa with Spinderella, Biz Markie, Kid ‘N Play, All-4-One, Coolio, Tone Loc, Rob Base, And Young MC. Towne and his team utilized left-right EAW KF line arrays to blanket the covered seating area. Each array consisted of eight KF740s with four KF730s. The KF740s covered the far seating while the KF730s were utilized for the seats closer to the stage. AEE tapped into a permanent system to cover lawn seating. The recent voicing update incorporates improved equalization, crossover, Focusing and limiting parameters for enhanced clarity and tonal balance. It also brought DynO dynamic optimization to the KF740 for increased system protection and 4 dB additional low-frequency headroom. 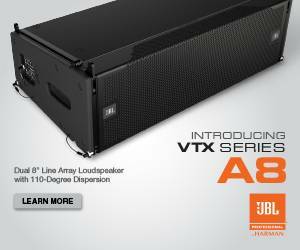 AEE didn’t disappoint in the “low end” with sixteen SB1000z and four SB730 subwoofers in use. The SB1000z subs were stacked four by two under each array. The SB730s were ground stacked in front of the stage to further drive the system. Side fill coverage was handled by left-right arrays made up of three KF730 modules stacked on two SB730 subs. Six single KF730s spread along the lip of the stage took care of apron fill.